Home » Blog » Dental Crown Or Porcelain Veneer? 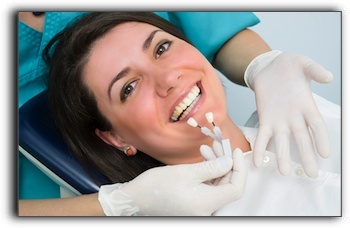 Allen Park cosmetic dentistry offers multiple procedures for improving smiles. Two of the most popular procedures in the Detroit area are dental crowns and porcelain veneers. It takes a team of experienced Michigan dental professionals to create durable, natural looking and perfectly functioning crowns and veneers. Your Detroit cosmetic dentist must prep the tooth, create a precision mold, and communicate to the lab technician exactly what is needed. The role of the Allen Park dental lab technician is equally important. He/she must meet the precise standards necessary for successful restorations: the perfect shape, the perfect size, color that blends seamlessly with surrounding teeth, and the proper placement in the mouth. The team at Szalai & Szalai DDS provides the highest quality cosmetic dental services and restorations.